Last week I took a drive to Marsden in West Yorkshire to visit Alfie's Studio, run by online friend, Nicole Clarke. Nestled deep in the Colne Valley, getting there is a bit of a drive as it is full of twisty, narrow roads. There are warning signs in several areas that light up when there are bad weather conditions and snow, things I've only ever seen driving into the highlands of Scotland, not seven miles from Huddersfield. But the journey is totally worth it as it takes you through hamlets of charming Yorkshire stone cottages and offers some simply spectacular scenery, with the light one minute dazzling, and in the blink of an eye, dark and gloomy. These valleys can seem oppressive and bleak to some, yet I find them utterly beautiful. Many of these former textile towns and villages are now home to fabulous independent shops and cafes, food producers and have thriving art scenes, with sculpture trails, galleries and local festivals. I arrived a little earlier than I expected in Marsden and so went off in search of a cafe. Only a couple of doors down from Nicole's shop is the Marsden Moose Cafe, which proved to be a great find, with super friendly staff, amazing coffee from local roaster Darkwoods and a really good sounding menu with lots of local produce being used. After a quick caffeine injection, I headed to the Alfie's Studio shop to take some photographs. 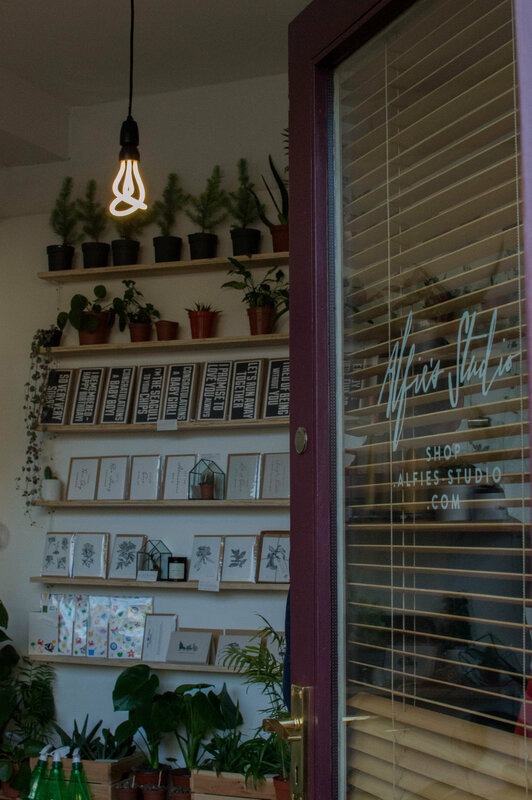 Run by Nicole and her husband Alan, the store is tiny but packed full of lovely plants, candles, homewares, books and Nicole's own designs of cards and stationery. The message behind all the products they sell is simple - 'A collection of great goods with awesome stories', so here you will find locally made natural beauty products from Nathalie Bond Organics, woolen blankets woven individually on the loom, jewellery made from reclaimed vintage china and books from the Do Publishing company. These sit happily alongside plants chosen mainly for their air cleansing properties, many grown by Nicole and Alan as part of their Outdoors-In project - a fusion of a love of greenery and being green. A mixture of home studio and shop. I do my design and dreaming at home away from the distractions of chatting to the locals and fussing with the plants... Alan (my very patient Mister and shop boy extraordinaire!) mans the shop on a Saturday and we are (of course) open by appointment too. I used to gravitate towards books, blogs and magazines to see what others were doing but now prefer to pave my own way. That having said, other people and their ethos and ethics are an inspiration and it's become a cliche, but true - Instagram has been vital to meeting new people and discovering co-collaborators. Beyond that, I find inspiration all around. From the beautiful scenery we are fortunate to be surrounded by (when it isn't under a layer of dense fog or rain) to the small people in my life who open my eyes every day and keep me accountable for creating and cheerleading for the kind of world I want to live in and for them to grow up in. You already collaborate with some fantastic local makers and artists, but who would you love to collaborate with in the future? I have a collaboration project with Harper Leather currently in the works (minimalist wallets and tool rolls), working on something new with The Glass Gardener who makes our glass house terrariums and hopefully an upcoming one working with someone on some cloth tool rolls and a "tote bag for all reasons" and previous collaborations include Pedlars, Earl of East London, Botany and Father Rabbit in New Zealand, so I don't really have a wish list for that. Generally if I want to collaborate with someone I'll approach them (even if it takes a while to pluck up the courage) and make it happen. Probably the one thing that I haven't done so far but would desperately like to is work with a clothing maker on a line of really great, basic but timeless clothes that are ethical and affordable. I'm quite utilitarian and extremely fussy about quality and environmental credentials, needless to say my wardrobe is fairly limited at the moment as it seems to be one area that the UK has to play catch up. I love Finisterre's ethics and devotion to innovation in fabric technology and Toast's approach to creating quality timeless pieces that last, so either of them would be great. What are your favourite plants and flowers to work with? No, you can't ask me that. That's like asking which child is my favourite surely? They all have their own personalities and quirks. The cacti are fascinating in their symmetry and beauty and each seem to have their own character traits. The monsteras make me feel like I'm in a jungle and every new split leaf is a small joy. Ceropegias are therapeutic to untangle for packaging. The ficus has beautiful architecturally rich leaves. The ivy are super plants when it comes to the environment (which drew me into working with plants in the first place). The oxalis are grown completely by me and make people super happy so I guess they might have the edge? All of them! What's been your highlight for 2016? Opening the shop was somewhat of a milestone. Falling down the rabbit hole of discovery. 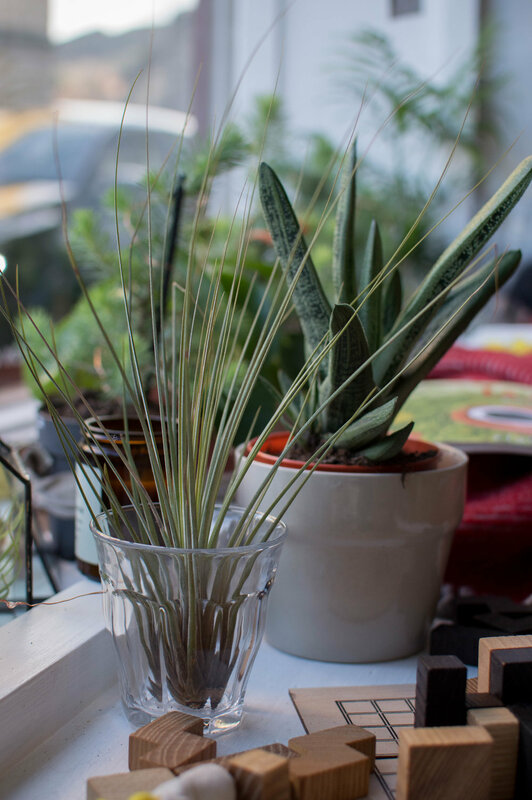 Learning all about plants and air quality in the home, delving into the science behind candles and the chemical components and how they affect our environment, Alan is an environmental scientist and that has had great bearing on how we run things. I've become massively bothered about pollutants and our environmental impact as a business but also as a family and more basically - humans on earth, likewise bad kerning and awful logos now upset him... On a slightly more personal note I met my long time design hero - Karl Hyde (perhaps better know for being half of Underwolrd of "Born Slippy" Fame) and he was possibly one of the most intriguing people I've ever had the good fortune to meet. Online at Alfie's Studio.com and in our bricks and mortar in our home village of Marsden, West Yorkshire. 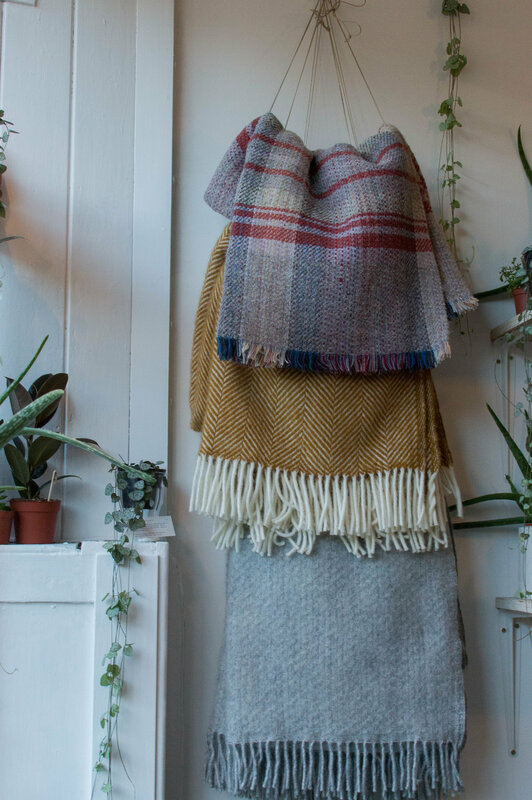 There are also stockists for the design wares I create up and down the country, from Edinburgh to London, I stopped supplying overseas because the air miles didn't sit well with me. What's next for Alfie's Studio? For the shop... Lots more collaborations! It has become one of my favourite things, I think it's important to champion other UK makers and at the same time I get to meet some uber talented people, and stock exactly the thing I want to sell, whilst helping people live their dreams and follow their callings, there is no bad part of it. We are moving towards stocking more UK grown plants which is actually quite a challenge, but one we are enjoying beginning to tackle by speaking to local growers and propagating some of the plants ourselves. On a similar note we are looking forward to taking "Outdoors In"* to new heights and are passionate about passing on our knowledge of how to be more responsible for your health and environmental impact in your immediate space simply with the use of plants! Thank you so much Nicole and Alan for answering all my questions! Visiting the shop you can tell instantly that this is something they have both nurtured and are so passionate over (and I loved that they described the shop to me as the home they would have if they didn't have kids! I totally get that). I left after making several purchases - a couple of plants, some beeswax candles and one of Nicole's beautiful notebooks. I'll be back soon (as long as they don't shut the snow gates!). If you can't get to the shop in person, do visit their beautiful website and blog as it's one of my absolute favourites or follow Nicole on Instagram (she is also the creator of the wonderful hashtag project #ihavethisthingwithglasshouses).